Marilyn Hacker is an award-winning poet best known for formal poems that mix high culture and colloquial speech. Born in New York City, educated at Washington Square College of New York University and the Art Students League, Hacker’s career spans forty years establishing herself as a preeminent voice in the tradition of Robert Lowell and Adrienne Rich. Openly lesbian since the late 1970s, Hacker has created a poetry that is feminist, political and intimate at once. Hacker couches the urgency of love, desire and alienation in brash, up-to-the minute language, writing from her perspective as a feminist, lesbian and cancer survivor. Hacker has received many of poetry’s highest honors, including a National Book Award for her first collection, Presentation Piece (1974). In Separations (1976), Hacker begins to articulate her dissatisfaction with woman's traditional roles. Taking Notice (1980) and Assumptions (1985) contain reflections on the women in her life, including her mother, friends, and lovers. Love, Death and the Changing of the Seasons (1986), a poetic novel of a lesbian love affair, is an evocative and sensual work. In Going Back to the River (1990) the poet comes to terms with loss after the dissolution of a love affair as she writes of loves and life in Paris and New York. In Winter Numbers (1994) Hacker evokes memories linking the historical and personal disasters of her generation: the Holocaust, AIDS, and Hacker's own fight with breast cancer. Selected Poems, 1965–1990 (1994), which contains work from five of her published books, reveals the many voices (lesbian, feminist, mother, Jew, intellectual) with which the poet speaks. Hacker has received numerous honors, including the Bernard F. Conners Prize from the Paris Review, the John Masefield Memorial Award of the Poetry Society of America, the PEN Voelcker Award, the Argana International Poetry Prize from the Beit as-Shir/House of Poetry in Morocco, and fellowships from the Guggenheim Foundation, the Ingram Merrill Foundation, and the National Endowment for the Arts. 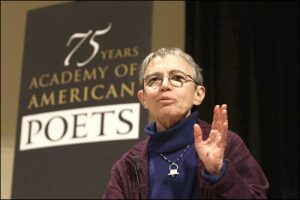 In 2008, she was elected a Chancellor of the Academy of American Poets. She lives in Paris.